Wrapping up the craft beer club...it's been a long time coming. Closing it out with a hometowner. The name of this one reminds me of a term some British friends used once, in regards to a certain affliction that men must endure during humid summer months- 'Betty Swollocks' (in case it's not obvious, switch the 'sw' and the 'b' sounds). The website says this is an unfiltered hef, but if that's unfiltered I'm wondering how the hell else they got it so clear. Hefs are tough. Well, tough isn't the right word...more like unfair. Because my baseline hef is the incredible Thunderweizen. But hey, as they say, if you want to be the best, you've got to beat the best. Or at least hire someone to jump out and hammer them in the knee with a tire iron. It smells nice and wheaty, sweetish and a bit funky. Definitely more summery than the previous effort. It also smells lightly vanilla-y, which is a nice touch. There's only a very light touch of the banana/spice aromas, which are always pleasant when generously applied and missed when they're not. Remember how the Dry Dock Hefeweizen was like a watered-down Thunderweizen (yeah, probably not)? This is like a watered-down Dry Dock. 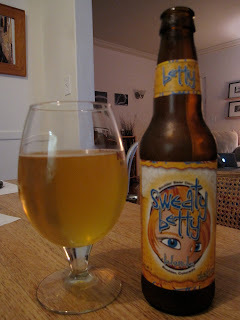 The wheaty funk is light, the spiciness is light, the fruitiness is light, everything is just really light. But it's still tasty, super easy-to-drink, and very refreshing. It's pretty much the Coors Light version of a hef. Which means you could polish off a baker's half dozen and still feel spry enough to do some ill-advised parkour. After you peed for about six minutes, of course.